During the 1702 Parliament the Tories had shown that their views in relation to the major issues confronting the nation – the Church, the war, the succession, and the question of union with Scotland – were out of gear with the nation’s interests, particularly in time of war. Although both the Queen and Godolphin would have preferred to avoid single- party government, the unruliness of the Tories had made it necessary for the duumvirs to depend increasingly on the Whigs. In the 1705 Parliament, however, this gave rise to new pressures on Godolphin as the Whigs began demanding a greater share of government. 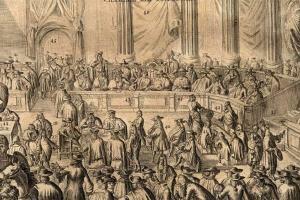 The election held in May and June 1705 saw contests in 110 (41 per cent) of the 269 English and Welsh constituencies. 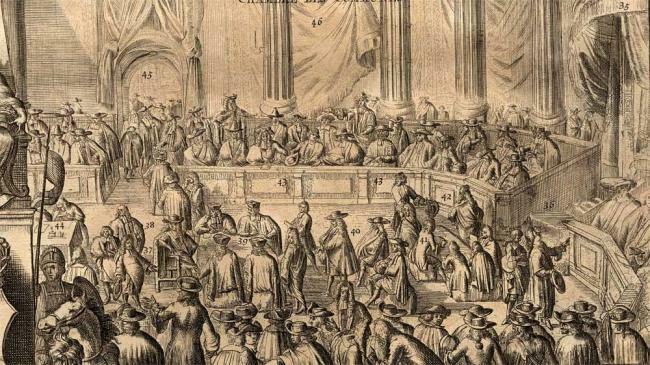 Following their failure in the ‘tack’ division in November 1704, the Tories campaigned on the basis that the Church of England stood ‘in danger’ from the Dissenters. Godolphin and Marlborough gave full backing to Whig interests in the constituencies while Whig propaganda stressed the importance of the war and the Protestant succession as the lead issues. Party animosities ran fiercely in this election and degenerated into mob violence in large boroughs and small. At Coventry, for example, pitched battles erupted in the streets between rival mobs. The new House consisted of 260 Tories and 233 Whigs, with a further 20 unclassified, though with Robert Harley’s ‘moderates’ among the Tory contingent, the two parties were neck-and-neck. Of the total of 577 MPs who sat during this Parliament, 151 (26 per cent) had no previous parliamentary experience. On the eve of the new Parliament Godolphin, recognizing the necessity of securing Whig support for the ministry in an evenly balanced Commons, appointed William Cowper, a rising Junto politician, as lord keeper. Similarly, on the first day, the Court supported a moderate Whig, John Smith I, for the Speakership, defeating the High Tory William Bromley II. In the Lords, the Tories sought to ensnare the ministry with their ‘Hanover motion’ proposing that the heiress presumptive to the throne, the Electress Sophia of Hanover, be invited to reside in England. Though unsuccessful, its intention was to force the ministry to disoblige the Queen if they supported it (as they must have wanted to), or to disoblige the Whigs if they opposed it. In the event, the motion proved ill considered, for it completed the Queen’s detachment from the Tories. With her blessing the Junto lords introduced the regency bill, designed to specify the arrangements for interim government between the time of her death and the arrival of her Hanoverian heir. It did, however, produce a furious struggle in the Commons during January and February 1706 in which some 50 ‘whimsical’ (or Country) Whigs’ sided with the Tories in accepting a sweeping clause to exclude many categories of ‘placemen’. The Junto nevertheless succeeded in obtaining a much modified clause in which only MPs appointed to recently-created offices were to be excluded from Parliament. The security of Godolphin’s ministry and its successful war strategy was borne out by Marlborough’s second great victory at Ramillies in May 1706. During much of the summer and autumn, however, Godolphin came under increasing Junto pressure for a greater part in government. Finally, in December, another of their number, the Earl of Sunderland (the former Lord Spencer, son of William III’s ‘minister behind the curtain’) was brought into the Cabinet as secretary of state. Harley – the other secretary – deeply despised the Junto and opposed the move, seeing it as a threat to his own position. Relations between him and Godolphin began to deteriorate. During the 1706-7 session, and with the help of the Junto, the ministry completed the parliamentary stages of the union between England and Scotland. Tory opposition to the guarantees given to the Presbyterian Kirk quickly crumbled. The Queen attended the Lords and gave her consent to the Act of Union on 6 Mar. 1707. On 29 Apr., a few days after the session closed, a proclamation was issued continuing the present Parliament as the ‘first of Great Britain’. Conscious of their growing indispensability to the ministry, the Junto lords stepped up their campaign for admission to the administration. In the early months of the 1707-8 session Whig criticism and attack focused on the mismanagement of the Admiralty, the failure of the allied cause in the Peninsula, and the additional measures needed to complete the union with Scotland. The major obstacle to greater ministerial co-operation with the Junto and the Whigs was Harley, who behind the scenes was counseling the Queen against them. Godolphin’s refusal to countenance Harley’s alternative ‘moderating scheme’ to admit younger Tories to the government, pushed him to intrigue further against the ministers. In February 1708 when Godolphin and Marlborough threatened to resign, Harley was dismissed from his secretaryship and took with him his followers, Henry St John, Thomas Mansel and Simon Harcourt I, plus most of the remaining moderate Tories in office. Harley’s fall from power did not favour the Junto, however. Instead, Godolphin filled the vacancies from existing Whig placemen – ‘the lord treasurers’ Whigs’ – notably Henry Boyle as secretary of state, and Robert Walpole as secretary at war. This new arrangement appeased many of the ‘whimsical Whigs’ who had lately made trouble for the ministry, and saved the ministry on 24 Feb. from censure over the disastrous defeat at Almanza the previous year. On 11 Mar. 1708, when the Queen attended the Lords to give assent to several bills, she used her prerogative of veto against one, the bill for settling the Scottish militia. Though this was the first – and in the event only – occasion she had used her veto, her intervention attracted little comment. The bill’s purpose had been to recreate Scotland’s militia, which had not been revived at the Restoration. However, the sudden appearance at this juncture of a Franco-Jacobite invasion fleet en route to Scotland seems to have given the ministers second thoughts, at almost the last minute, about allowing it to reach the statute books. It was the last occasion on which the royal veto was used.